Okay – it seems that one of the things modern game designers like is characters that last more than 5 or 10 minutes. The (almost) latest iteration of D&D, for example, seems to start characters out at a much higher power level than the old games. Part of this desire for survivability comes, I assume, from a desire to get young folks into the game. After all, kids don’t enjoy losing and if their first experience with a game is to spend time making an awesome character only to have them slain by the first kobold they see, they might shy away from the game and spend their allowance on penny candy and baseball cards (or whatever kids these days favor) instead of dozens of splat books. So, the thinking goes, the rules need to be changed to make the game more survivable at low levels. Wrong. I started playing D&D when I was 12. My friends and I would spend lots of time trying to roll up awesome characters. This was AD&D, so I’m talking paladins and rangers here. The scores needed to get these characters were pretty hard to achieve, but we managed to do it more often than not using the age old trick of … cheating! We fudged our rolls to get the characters we wanted, and then we fudged them some more to keep them alive. Scandalous, I know – but there it is. Designing a game to appeal to children (or, God forbid, adults) by making it easier is silly, because children can easily solve the problem of survivability and awesome characters by cheating their little heads off. You don’t need to corrupt your rules and throw the system off by making the cheats official – just make your game and let the chips fall where they may. Heck – the only reason paladins and rangers were ever worth cheating to play was because they were so dang hard to roll up fairly. I played with some groups that went through character sheets by the ream. Character deaths were so frequent rolling up new ones and personal naming conventions were well established. Some characters died before they ever got a name others had names like “Sir Black the 9th” who was quickly followed by “Sir Black the 10th”, “Sir Black the 11th”. One guy had the same name with two letters switched between each life. Success wasn't measured in exp, g.p. looted, monsters slain but by feet into the dungeon we got before retreat or the TPK. The longest part about character generation in those days was buying equipment, some expeditions were saved by gathering the left behind gear of those who had gone before and the party got further into the dungeon. And we liked it that way. If you could manage to have a character survive to reach 2nd or 3rd level in such a campaign it was awesome and if you got to a high level like 9th or 10th it was epic. And we liked it that way. The adult version of this is “make whatever you like” and it works pretty well for me. As an adult GM, cheating aka “DM Fiat” works well too. Also the biggest “survival aid” to characters IMO is Greyhawk Average Hit Points, that is Max at L1 and Middle Number +1 thereafter. This helps a lot. For those who like HP rolling, GH Average or Rolled whatever is better works well too. Why not design a game that delivers what people want rather than encourage them to cheat? The whole use seems to me to come down to two questions: What value does difficulty have in the role-playing game context? And even if “hardness” is desire, is character death the only way to achieve that? To me, cheating kinda defeats the purpose. If I put a character in a video game in “god mode”, and blow through all the challenges unscathed, does that make me a better player? Not likely. To me it's silly to take the time to roll, if the lethality is cranked so high. Why not just have a computer generate all your stats and simply generate a card with those computer figures to hand the player? Why invest any more emotion than you might, say, put into checkers? I think higher hit points at lower levels is a good thing. I used to have DMs that started you out at higher levels to avoid this, I had another that said you get max hp at 1st level, and another that had you select a 0-level class simply to get the hp boost. It is obviously a concern for some old-schoolers (myself, as well as the others I game with) as well as merely the younger crowd. Difficulty is achieved by good design, and good players are forged by adversity, not TPKs. Word Verification: Catimp (n.) – A particularly mischievous creature that favors, more often than not, taking the form of a cat. Like so many other things, I think it's a question of roll vs role. If you're playing D&D like a social videogame, characters that die in five minutes are fun. It's all about building a character that can survive the game. If you're playing D&D like collaborative storytelling, characters that die in five minutes are boring because there's not much story to tell. Yeah. But of all the criticisms I might level at the game currently calling itself “D&D”, I don’t think I’d even bother with this one. To look at it from another perspective, I think there’s a case to be made for a shallower power curve than (traditional) D&D’s. In classic Traveller, Lejendary Adventures, and other games, PCs start out (arguably) more competent than 1st level D&D characters, and there’s a much smaller difference between a starting character and a retired character. A person might want to make a similar adjustment to D&D without it being about increasing survivability. I love all the discussion from this one. Really, my only point was – don't make a game easier simply to make it appealing to children. I'm not encouraging children to cheat – you can ask my daughter about that – but rather saying, if you're going to make it really hard to fail in a game, don't do it solely for the benefit of young gamers and their fragile egos, because they're probably going to ignore the rules and fudge the dice rolls anyway. In terms of player expectations, I also think it's easier to make a deadly system less deadly with houserules than the reverse. If players find out you're changing the rules to make it harder for them to survive and thrive, they might get a bit ticked off with you. Speaking as a former kid who started with old, deadly D&D – my friends and I loved it. The deadliness didn't turn us off, because we just ignored it. Speaking as an adult looking at the modern iterations of the game, the safeguards to keep you alive strike me as somewhat boring and make me less interested in buying and playing it. So – play your game the way you like, design it with whatever power curve you like, but my advice is do not design your game specifically to appeal to young egos – they'll be fine no matter what you do. And speaking as a separate adult, I never really enjoyed the churn of death from the older games. We made characters with whatever stats we thought made sense for the character. We made them at 5th level or higher because we hated the low level impotence. We /liked/ being big damn heroes. I drifted away from 2e DnD to be brought back by 3e, then drifted away from 3e to be brought back by Pathfinder and 4e. Once you start to ignore large swaths of the rules in order to have fun, you start to wonder why you stick with them to begin with… I've yet to find a game I think perfect, but I've generally appreciated the things the editions have fixed along the way. I fear this is heading into edition war territory. I'll just say again – I'm not suggesting one form of play or one system of rules is superior to any other. I'm only suggesting that designing a game to please children is not necessary. Designing to please adults who like a more story-intensive or heroic game makes sense, because adults tend to follow rules. Kids follow their imaginations, and won't let “stupid rules” get in their way of having a good time. Many designers now express a desire to bring more kids into the game – I merely suggest that you'll attract more children with clear, concise, easy to follow rules than rules meant to make a game easier to win. Most of our old D&D games had some kind of death deference mechanic added in, from -10 death threshold to a save vs. death at zero hit points. We still had characters die, but sometimes they would pull through despite amazing odds to the contrary. My AD&D1e game that I ran for about a year (2009-2010) was fairly lethal, yes, but I found that each player or henchman death seemed to make the party more clever, treacherous, and resourceful. I believe that without the threat of death (or at least a severe maiming), players behave in lazy and boring ways when faced with adversity. …oh, and for the record, I do try to avoid instant save vs. death, and I try to provide some clues when such a hazard is nearby. Just enough rope to hang themselves with, and all that. I think calling them 'cheats' is a bit disingenuous. 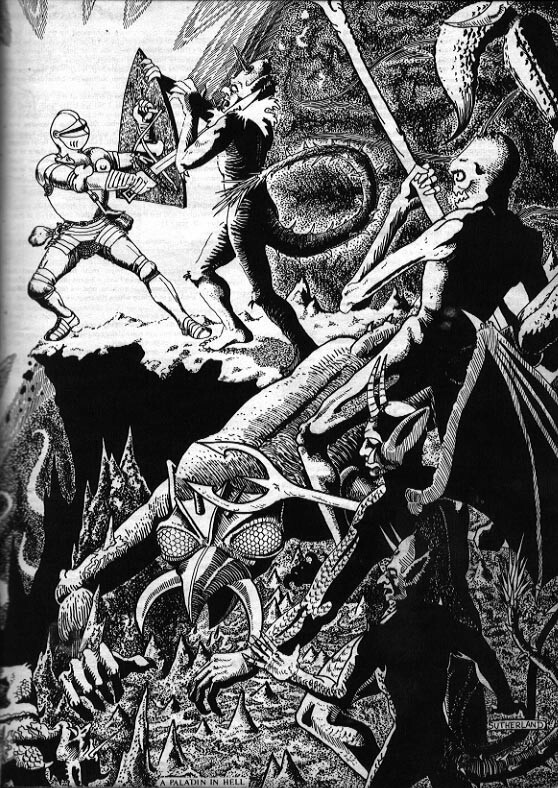 From AD&D on, the game changed to have higher (on average) attributes (seriously, 1st AD&D dispensed with 3d6 in order and all of the methods recommended for rolling characters produced far, far superior characters)and therefore (slightly) greater character survival rates. The game doesn't have to be a medieval horror game. The original system, played with Chainmail's combat system (as intended) saw a platemail fighter surviving roughly 72 attacks from spears and other common weapons before likely taking a killing strike. This was not the death churn that D&D became and then turned away from again. Also, younger audiences have different reference frames than the ones from the 70's. Most have never heard of Appendix N and if they do, it's via D&D probably…not the other way around. They have far different influences on what a fantasy character should be able to do and achieve, and dying 10' into a dungeon is not on that list. There is ZERO wrong with that, and wanting to play a game that reflects their cultural influences and frames of references is only natural. Making the mechanics emulate those interests is not dumbing it down or making the game easy for kids, it's just sensible marketing.